– We don’t allow costumes here. – These aren’t costumes … this is what we wear every day. – Well, you can’t wear them here, whatever you want to call them. The reason for the policy, explained by a manager, is that it’s confusing to other attendees who might think the costumed people are staff employees. In the end the couple had to leave but they were (after a lot of arguing, again according to the blog post) given their money back. This story brings up very interesting issues: What is costume? Where and when are costumes appropriate? The American College Dictionary defines costume as: dress or garb belonging to another period, place, etc. People who sport period clothing outfits full time, a growing trend, will argue that what they are wearing is their regular clothing and therefore not costumes. OK, from their perspective. But it seems to me that these well-dressed individuals don’t understand that to most everyone else (dressed head-to-toe in ath-leisure) they do indeed look like they’re in costume and that’s what can pose problems for museums and other attractions. The historical silhouettes of the Victorian period in particular – bustles and top hats for example – are so far from what we know and have known for nearly two centuries, of course they’re costumes. I can understand the potential for confusion and the need for policies. I think part of the costume problem is the variety of costumes that are popping up. It’s not just period clothing but also animals, comic book characters, and masks which are a security issue. Apparently, Butchart Gardens had a person show up in a ladybug costume. A teenage girl dressed as Tinkerbell caused all kinds of confusion at Disneyland. Venues don’t want the distractions and I don’t blame them. They have to draw a line and stick to it and … it’s not personal. Also, perhaps staff at these venues should be trained on how to handle people who are sporting costumes. Sneering and such is unnecessary and a very bad reflection on the individual staff member as well as the place of business. Respect on both sides will go a long way. Helen Uffner (far right) and her helpers. Left to right: Chelsea Bjerk, Lauren Bostic, and Dan Travis. Photo: Richard Aiello. Helen Uffner is well-known around NYC and Hollywood for having the best old duds. She runs her own business renting period clothing and accessories for theater productions, films, television, magazine editorials, and book covers. I met Ms. Uffner over hats at the reception opening for the Milliner’s Guild exhibition. 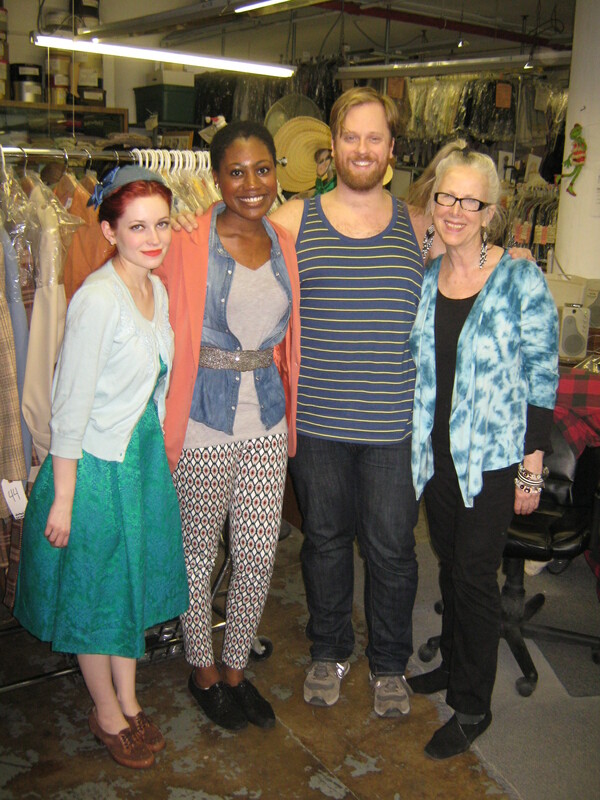 When I mentioned that I write about fashion and have a fondness for vintage, Ms. Uffner generously invited my partner and me to her warehouse. Now that’s an offer I wasn’t going to refuse. Plans we had for the next day were forgotten as we hopped on the subway to Queens and knocked on the door of Helen Uffner Vintage Clothing, LLC. It seemed a fun place to work. 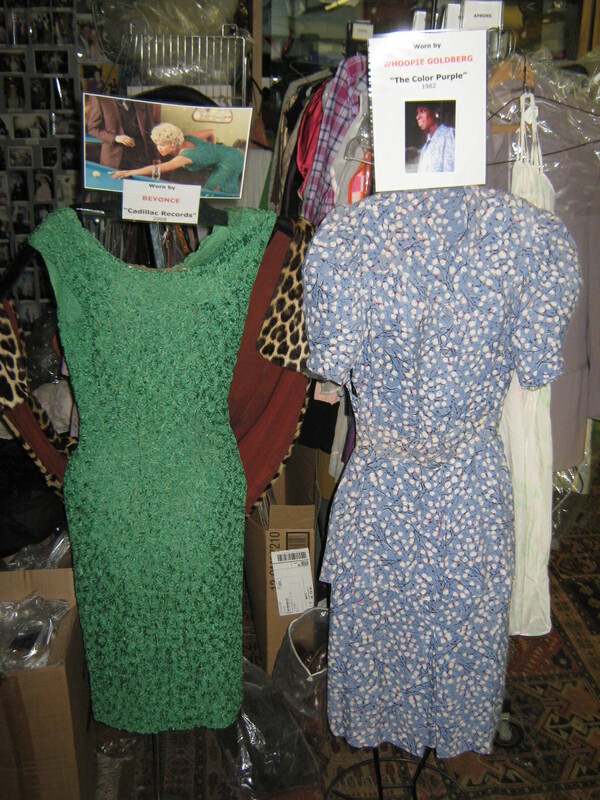 Vintage tunes played in the background as staff chatted with actors who were getting fitted for a local play. A woman visiting from Hollywood was sorting out costumes for an upcoming film. When not busy reorganizing or working with clients, the staff model some of the merchandise for Ms. Uffner’s Etsy site, Vintage Pickle. Apparently on some days they just can’t resist playing dress-up. What started as a personal collection for Ms. Uffner is now a 6000-plus square foot warehouse of clothing for men, women, and children from the 1860s on. Since she was a young teen, Ms. Uffner has been drawn to all things antique and vintage. Her first purchase was a 1920s beaded dress for $5, which she found at a flea market in Connecticut. “Then I went to a big antique faire,” she explains, “and I had to debate for about an hour and a half whether or not I could spend $20 on an Edwardian dress.” Good sense won out and she still has both of those dresses. As a fine arts major in college, Ms. Uffner continued to collect but never with the thought of wearing her pieces. She preferred to study the fabric and construction of what she considers works of art. Everything she bought she hung or kept in boxes at home. Before long she became the go-to person for friends and friends-of-friends in need of a costume for this or that. One day the costume designer for Woody’s Allen’s film, Zelig came over and ended up buying just about everything Ms. Uffner had. (BTW, the film won an Academy Award in 1984 for Best Costumes.) It was then that she realized she could rent rather than sell, and a business was born. In addition to basic clothing, Ms. Uffner has undergarments for men and women, hats, handbags, ties, shoes, anything needed for a complete period ensemble. Among her many clients are popular fashion designers who rent pieces to copy for their own lines. 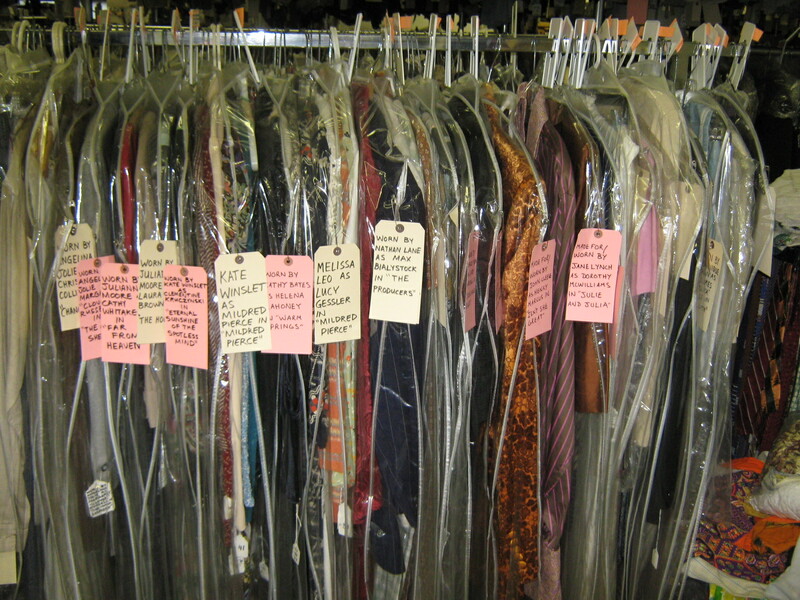 Ms. Uffner stores everything on racks or shelving arranged by time period, then color and fabric. “We don’t quite do it by decade,” she explains, “but by how styles changed.” Interns are charged with sifting through the racks looking for misplaced pieces, which is a great way to learn about vintage details. Details that Ms. Uffner can rattle off the top of her head. Such as, button-fly trousers for men are Victorian to the early 1930s. Over the past 35 years, Ms. Uffner has provided clothing for the films Fatal Attraction, Out of Africa, The Color Purple, Mona Lisa Smiles, Julie & Julia, Mildred Pierce (HBO), and Far From Heaven just to name a few. Currently staff is working on 42 and Behind the Candelabra. Theater productions include The Producers, The Seagull, Trip to Bountiful, and Breakfast at Tiffany’s. 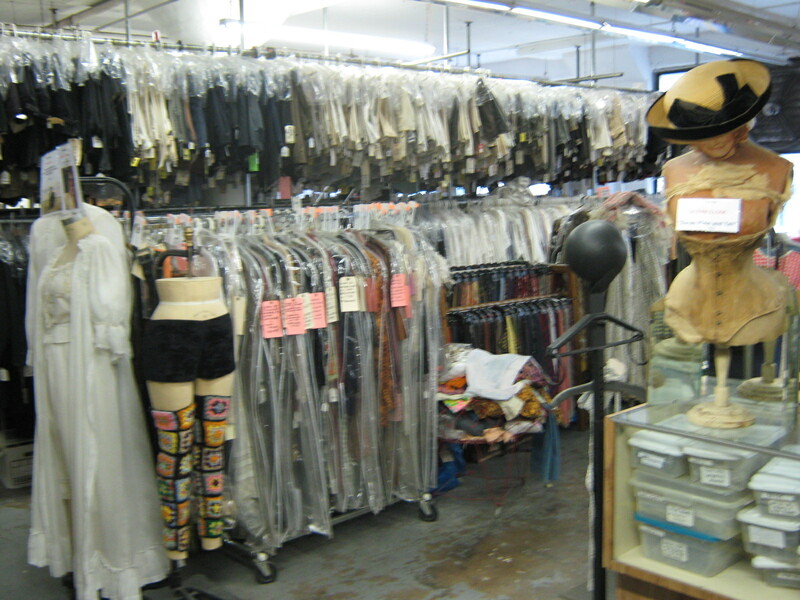 Oh, and Catherine Martin, costume designer for the new Great Gatsby film spent six months visiting the warehouse and renting various pieces for inspiration. Ms. Uffner spent two hours showing us around and answering our questions. It was a rare NYC treat for this vintage-lovin’ tourist.